For details on minor releases since FishEye 2.0, see the FishEye Changelog. 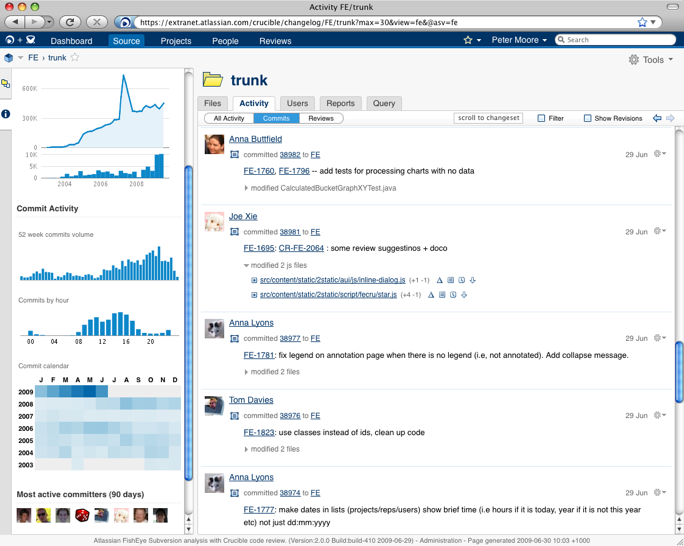 FishEye 2.0 adds enhanced JIRA integration and a brand new user interface. Thank you for your interest in FishEye 2.0. You can now download the FishEye 2.0 from here. See the documentation on Upgrading to this version. 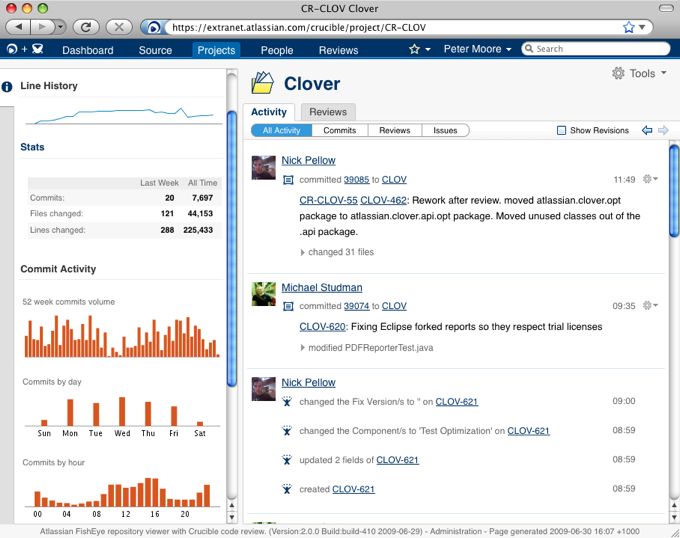 FishEye 2 provides an activity stream showing commits, JIRA issues, and Crucible review activities. 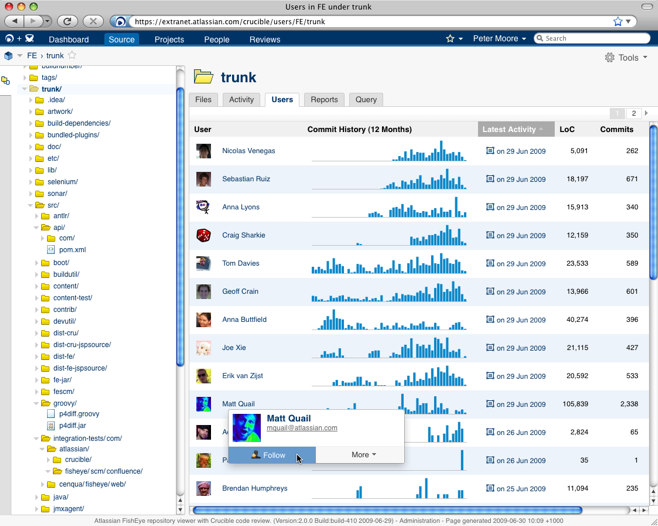 Activity streams are available across all repositories, from any directory, person, project and even individual files. Your home page provides a custom feed generated from the people, projects, and source you have selected as favorites. Each user and committer in FishEye 2 has a page showing their statistics and activity. 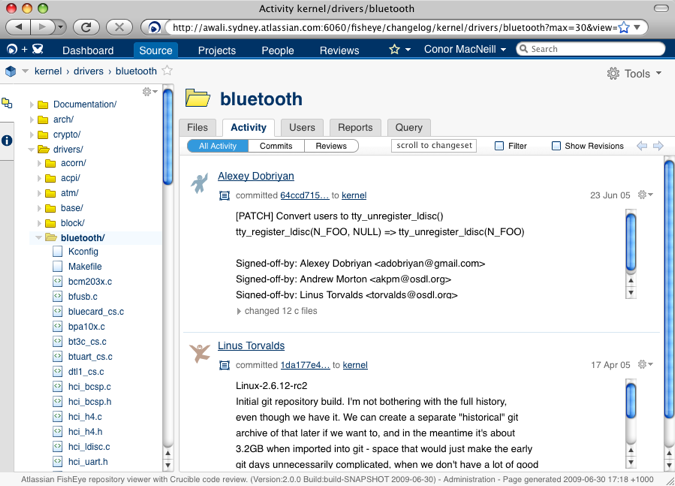 You can also see activity grouped by user from all repositories down to an individual file. 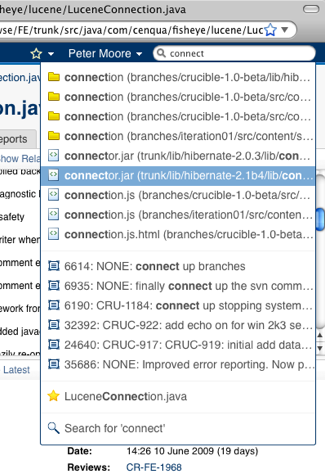 You can sort by latest activity, commits, line count, even reviews using Crucible. Clicking on the star icon on almost any artifact in FishEye adds that artifact to the your bookmark menu, and adds any downstream activity for that artifact to your personal dashboard. It also makes them searchable in quicknav. Charts and searches can be saved and given custom names for simpler reuse. 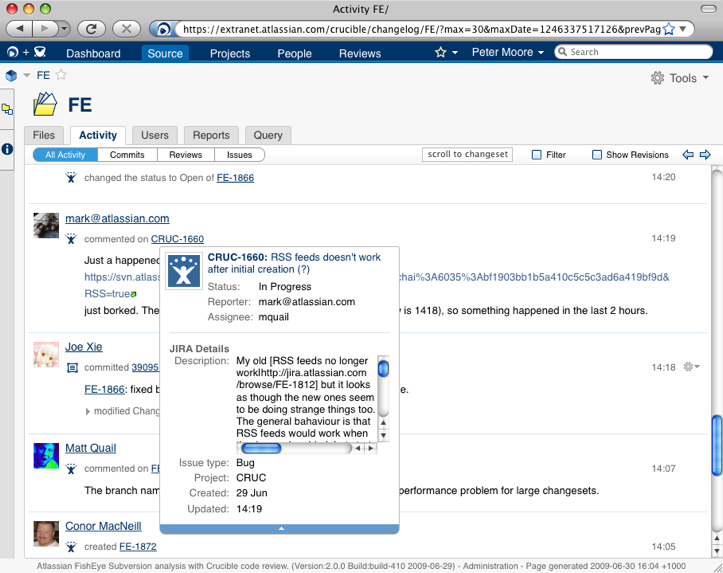 Multiple JIRA servers can be configured for your FishEye instance. 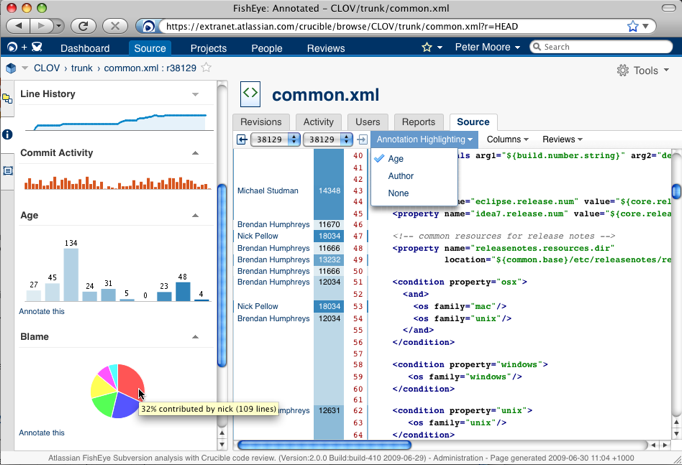 Projects and repositories can be mapped to one, several, or all JIRA projects. 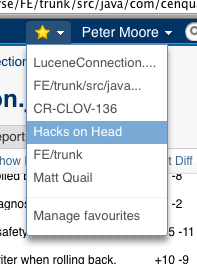 FishEye retrieves summary issue information when you mouseover a JIRA key anywhere in FishEye. Optionally you can include issue activity in your FishEye activity streams as well. Multiple repositories or subsets of repositories can be combined into a project to provide a more focused reporting and activity streams for teams that have source spread across repositories, or even different source control systems. The FishEye team has completely revamped the user interface. FishEye now uses an intuitive three pane view, with a rewritten file explorer and collapsible chart and information panes. There is better access to menus, user hovers, and lots more. Typing into the search box on the top right of every page now gives you quick access to directories, files, changesets, even your personal favorites. Quick search now works across repositories and is significantly faster. FishEye 2 adds beta support for Git repositories. There are still a few kinks to be worked out, but it provides full access to FishEye's functionality.